There are many reasons why people find it difficult to master new software and computer programs - let's face it - without clear visual guidance it can be pretty daunting. Reading an instruction manual filled with jargon can often leave you more confused than you were to begin with! If this scenario sounds all too familiar, then my video series could be just what you need to turn a corner. When you sign up to participate in my video tutorial series, you'll be given precise information that shows you exactly how to use Adobe Photoshop CS4 and get the results you need. This solution is just what you need to get real results, because unlike another dry, dull eBook - you'll actually be presented with a visual, video guide that goes step-by-step through using Photoshop. The easy to follow format means that you get an incredible amount of hands on knowledge, so you can master Adobe Photoshop quickly and simply. The video tutorials cut straight to the heart of things, skipping the filler information that you'll find in eBooks. Instead you'll be presented with precise videos that demonstrate exactly how to do a range of useful things with Adobe Photoshop. Editing and managing your photos has never been easier! With all the information in this series presented in a structured format, you'll be able to take your time and self-pace your learning. That means that you can absorb more information which you can then apply to the management and editing your own images. 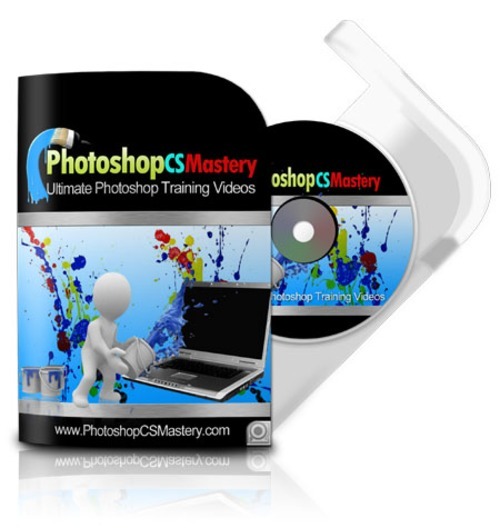 Once you complete the series, you'll have dramatically increased your knowledge base and mastered an incredible number of applications offered with Adobe Photoshop software. Prepare yourself to be blown away with the speed at which you progress from an inexperienced Photoshop beginner to highly skilled photo editor! All this and a great deal more is covered in the tutorials included in the Photoshop CS Mastery Video Tutorial Series! If you want to confidently use Photoshop without spending days or weeks trying to decipher a jargon-filled instruction manual, then you need my video series - even if you're a complete beginner. My video tutorials takes you step-by-step through genuinely comprehensive information on using the many tools in Photoshop. You'll be blown away by just how much you'll learn using these entertaining visual video tutorials - ensuring incredible image editing results! Video 2 covers zooming an image, scrolling and panning, changing pixel dimensions of an image, selecting and adjusting image resolution, resampling and speeding up navigation with the Navigator Panel. During the tutorial in video 3, you'll discover a number of options for cropping and manipulating images. This includes using the crop and trim tools, the crop command, transforming perspective while cropping and rotating the entire picture. When you get to video four, you'll be receiving guidance on how to carry out color correction. Enhancing color can have a dramatic impact on your images and this is what is covered in the color correction tutorial. You'll learn how to apply the variations command, adjust hue and saturation, colorize a grayscale or create monotones and finally how to specify the range of colors to be adjusted when altering hue and saturation. Video 5 takes you through removing pesky problems such as red eye. Photoshop also offers highly effective tools for re-coloring your images. You'll be shown how to replace color in image areas, improving the tone and brilliance of your photos. If there are any problems that need touching up in your images, then you can't miss video 6! In this video, I'll introduce you to a number of options for retouching pictures with the Clone Stamp tool, the Healing Brush tool and the Patch tool. In addition to this, you'll be shown how you can repair areas of your image using a pattern. In video 7 you can view my demonstration on selecting areas of your picture. This video shows you how you to pinpoint the areas of your photo that need editing, manipulation or repairing. There are different selection tools which can be used for different editing tasks. This video will cover selection with the Marquee tools, the Magnetic Lasso tool and the Polygonal Lasso tool. Video 8 guides you through the grouping and compositions of your images. Composition is an integral part of a well structured image. When you are creating dynamic images, you can use the tools demonstrated in this video to create multiple layers and group various objects. This tutorial covers creating a new layer or group, creating a new layer with effects from another layer, converting a selection to a new layer and finally applying and viewing layer composition. Video 9 looks at creating new effects with your images using Opacity and Blend Modes. This video gives you an understanding of how to create image effects using opacity at different places on various layers or across selected groups. The video also demonstrates blending modes and how to add blend and fade filter effects to your photos.